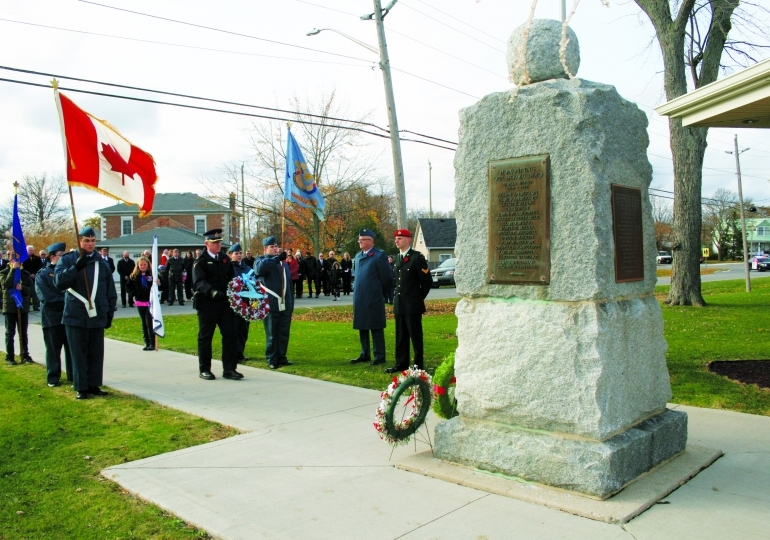 The ceremony at the cenotaph in Caledonia began at 10:45 a.m. on November 11. 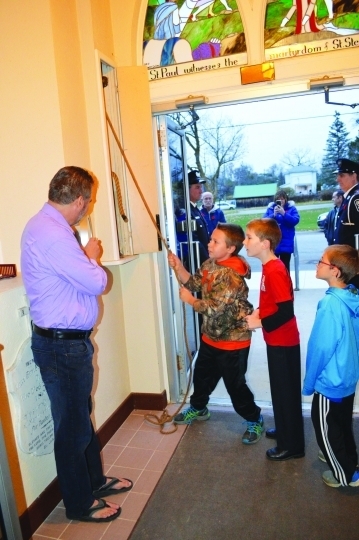 Once the service was complete, local churches began ringing their bells, like they would have 100 years ago, in celebration of the end of WWI. 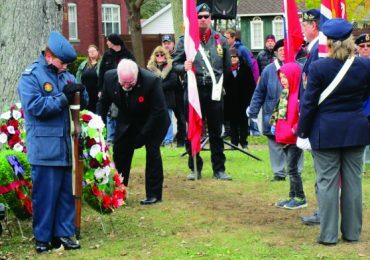 Everyone was invited to the Caledonia Legion for a light lunch, or to tour the Edinburgh Square Museum, after the ceremony. 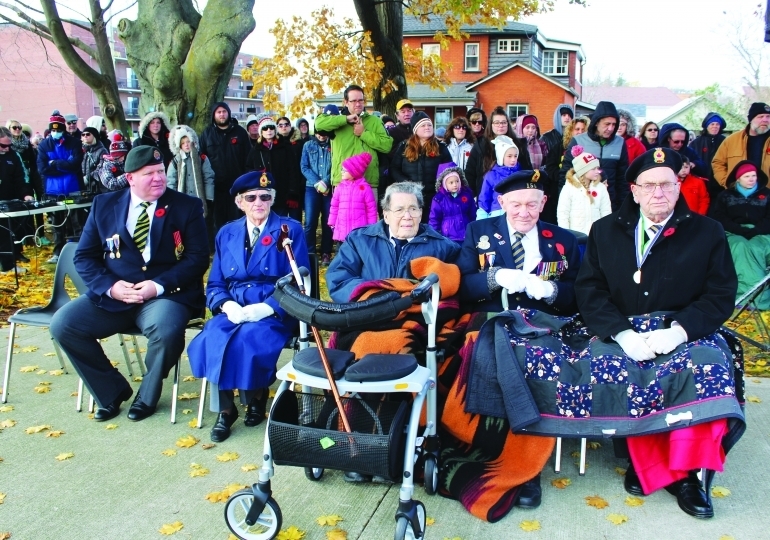 Shown are Shayne Chick, Mary Guyatt (widow of veteran Alan Guyatt), Remy Ridge, Heath Patterson, and Jack Cummings, all members of Caledonia Legion. 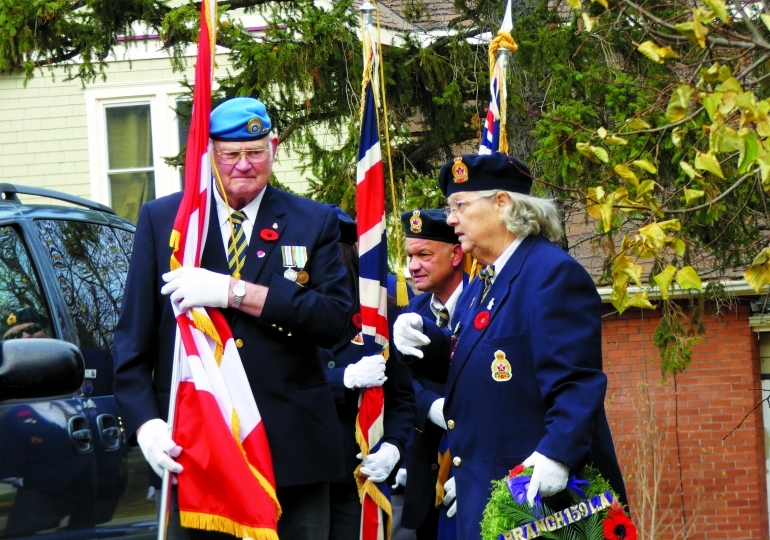 Hagersville Legion’s Colour Party and contingent visited the local schools and seniors’ residences during Remembrance Week activities. 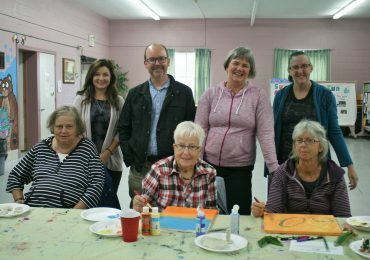 They visited Hagersville Secondary School, Rainham Central School, New Credit School, Walpole North, Jarvis Elementary, Jarvis Christian, Hagersville Elementary and St. Mary’s; they also visited Anson Place, Leisure Living and Parkview Meadows in Townsend. 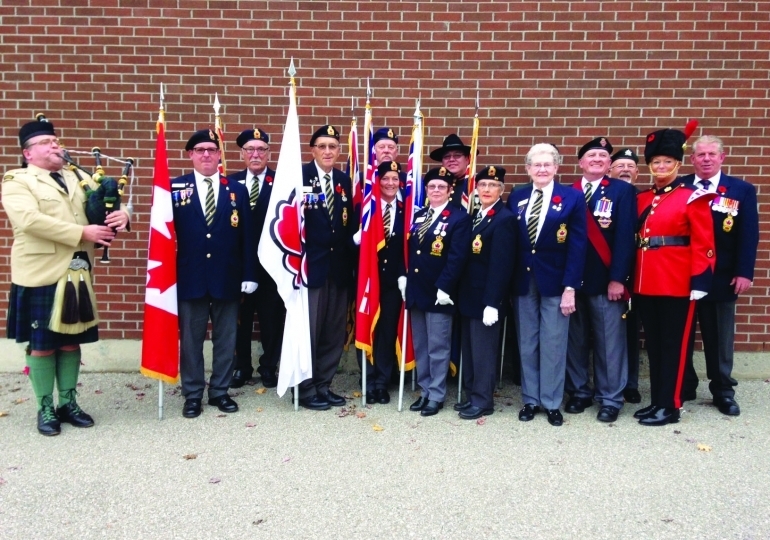 Pictured from the left: Jim Yates, piper; Brad Davidson; Erle Davidson; Don Laidlaw; Paul Seabourne; Wendy Austen; Karen McMurchy; Marwood White; Donna Slote; Ron Dwyer; Marg Long, vocalist; George Roach, Sgt.-at-Arms; Ron Falla; Laura Jean Falla, bugler; and Jack Esselment, Branch 164 President. Absent: Lucille Burgess; John Cunliffe and Andrew McKellar. 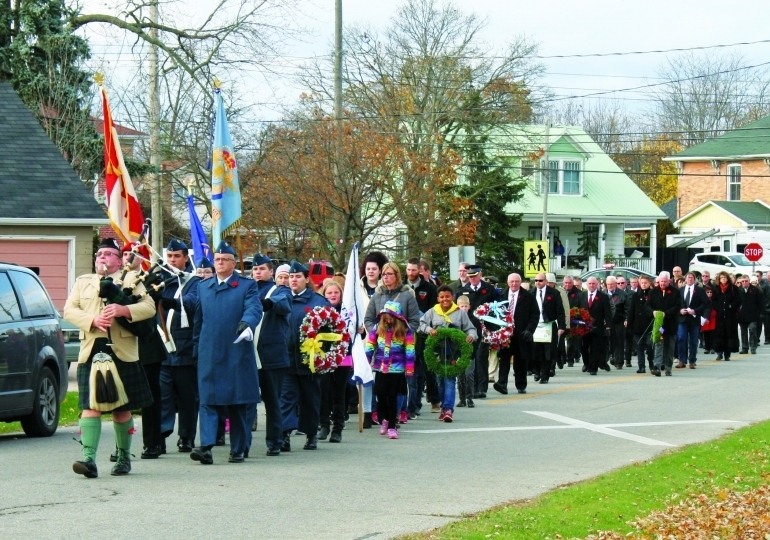 They visit the schools and senior residences to bring the message of Remembrance to them and to encourage them to come out to Remembrance Day services in the community; the Colour Party marched through both Hagersville and Jarvis on Sunday, November 11, 2018. They also encourage the school children and teachers to produce a program to present on the visits. The schools really come alive with enthusiasm and interest with their artwork, poems and essays about Remembrance. 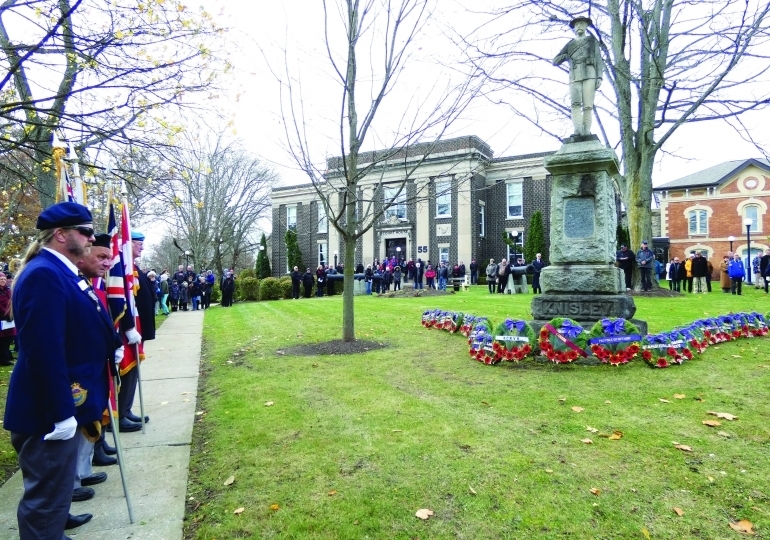 Crowds gathered outside the Cayuga courthouse on November 11 to pay tribute to past and present military personnel. 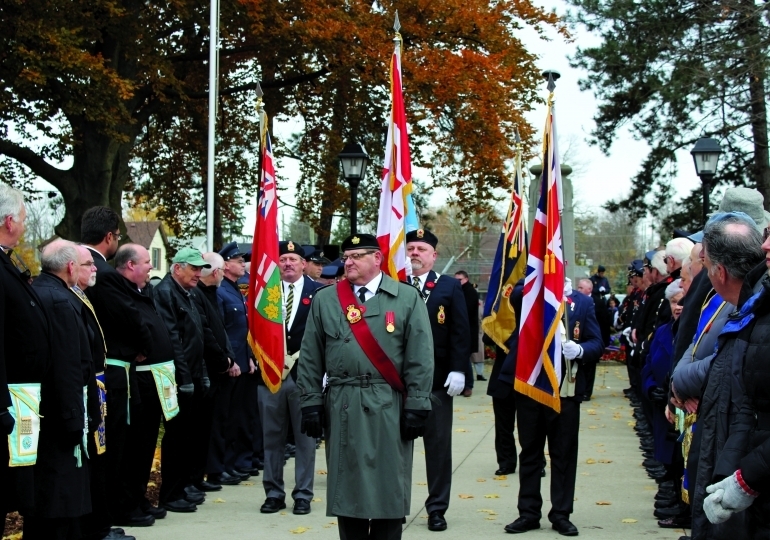 The colour party is shown preparing to march. 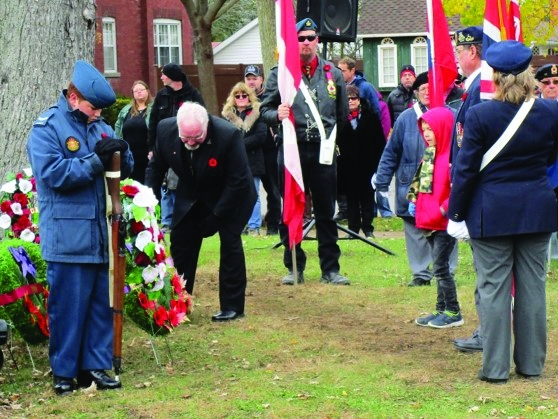 Shown is one of the participants laying a wreath at the Jarvis Cenotaph. 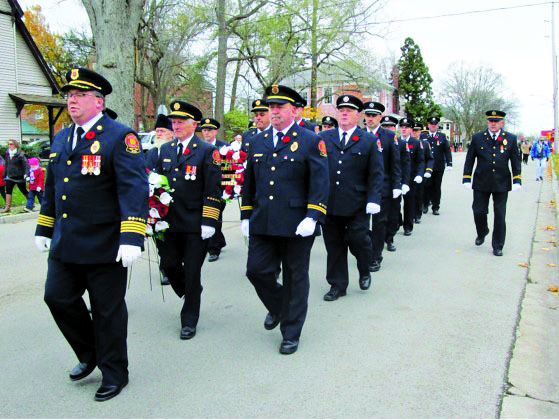 The Jarvis Ministerial led a service of remembrance on the afternoon of November 11 at Knox Presbyterian Church. 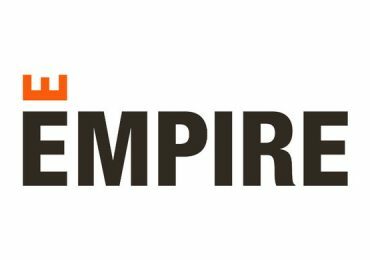 Pastor Mark Vanderwier shared a message on “The Price of Freedom”, reminding the congregation that our freedom came at a great cost. 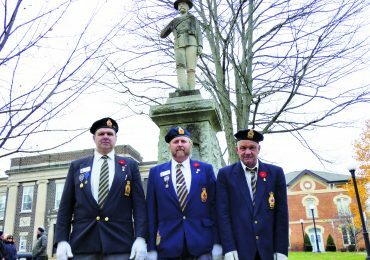 Following the service, the colour party and congregation were led by piper Jim Yates, of Townsend, to the cenotaph for the roll call of fallen soldiers from the World Wars and Air Force, and the laying of the wreaths. 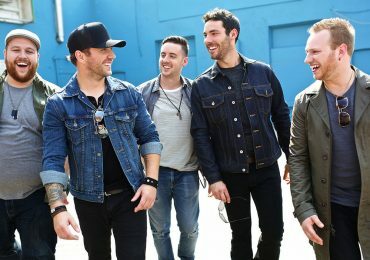 Pictured are participants who included Cpl. Mike Sposato, 611 Harvard Dunnville Air Cadets, the Jarvis Cadets, Jarvis Gems, Jarvis Lions, and members of the community. Firefighters walked alongside many others from the Dunnville Legion Branch 142 to the cenotaph, where the Remembrance Service took place on November 11, honouring the brave men and women who serve and have served this country.